The Capital Region Chapter of the Public Relations Society of America is happy to sponsor Startup Grind Albany’s rebroadcast of the Guy Kawasaki Interview to a live audience at Overit in Albany. Join us Wednesday, March 18th as we project a rebroadcast of a “fireside chat” with social media icon Guy Kawasaki, directly from Google HQ in Silicon Valley from earlier that morning. Guy will be interviewed by CEO of Startup Grind, Derek Andersen. WHEN: Wednesday, March 18, 2015; 6:00 to 8:00 p.m. 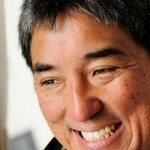 Guy Kawasaki is the chief evangelist of Canva, an online graphic design service out of Australia, and an executive fellow at the Haas School of Business at U.C. Berkeley. A former advisor to the Motorola business unit of Google and chief evangelist of Apple, he is also the author of APE, What the Plus!, Enchantment, and many other books. Guy has a BA from Stanford University and an MBA from UCLA as well as an honorary doctorate from Babson College.